I must disagree. Where do you think these so called renewables come from? Where does humanity get the energy to develop them? Where does humanity get the energy to mass produce them and distribute them far and wide? Renewable sources of energy, as you call them, are all reliant upon fossil fueled industry. Every single one. None of them are actually renewable and all of them rely upon the availability of resources that are all produced, refined and moved around with fossil fuels. In order to build the necessary infrastructure and develop the technology you’re saying will keep the carbon in the ground, you have to pull the carbon out of the ground. Resource depletion (which is what Peak Oil is all about) is ongoing and already effecting the global economy. The oil needs to stay in the ground. If you burn the oil to develop the “renewable sources of energy” then what have you accomplished? Exactly what you feared would happen. The ONLY answer is to depower and decomplexify as much as possible. Thank you for your comment. I’m always wary, though, when someone says “the only answer is….” There are many parts to “the answer” here. Two of them relate to, but are different from, “depower and decomplexify.” (I’m not sure the latter is actually a word.) Deep energy efficiency and dematerialization are the terms I’d use instead. And especially once energy demand is cut, there’s no reason why our energy needs (and more) can’t be met by renewables. I’m mystified by your claim that “Renewable sources of energy … are all reliant upon fossil fueled industry.” By definition, they aren’t. Yes, we will continue to need fossil fuels in the short term as we migrate to renewables. We don’t have enough power generation capability via renewables – yet. So the initial production of equipment like solar panels and wind turbines, and upgrading to the smart grid will require mostly carbon-based energy sources. But that’s only needed in the transition period. That means the question is mainly the timing. Can we convert fast enough (while heavily pursuing efficiency and dematerialization of our consumption) to leave most of those fossil fuels in the ground? Do we put our innovative abilities and financial resources into converting to renewables or into refining ever less productive sources of unconventional fossil fuels? If we don’t, then, yeah, it’s probably “good bye industrial civilization” as well as, perhaps, much of humanity. But we still have an alternative, and it leaves us in a much better place than we are now. I believe you’re splitting hairs when it comes to the definition of renewable energy but I’ll follow you down that rabbit hole. Technically speaking, renewable energy are sources of energy (tapped or not) that are replenished within a human lifetime. Socially speaking, however, renewable energy equates to the technology that allows society to capture, store and use the energy that can be replenished within a human lifetime. Renewable Energy (RE): The raw, renewable energy sources. Renewable Energy Technology (RET): The technology that allows humanity to harness and use Renewable Energy. It is that technology that is helplessly dependent on fossil fuels. Any technology (or society) that relies on fossil fuels for its existence is … not … renewable. Yes there is more than enough raw energy coming from the Sun, Wind, Tides and Earth every day to power civilization but the technology to enable that requires fossil fuels. Therefore, you’re advocating for the use of technology that requires that we pull a majority of the remaining carbon out of the Earth. That is a bad idea no matter how “efficient” the technology becomes. Jevon’s paradox also has something to say about increasing efficiency. Not only that but the remaining carbon is much more difficult and costly (in environmental terms and economic) than ever before and it is only going to get worse. Back in the 70’s it was a question of timing. World population was well under half what it is now and the cheap oil was still flowing easily. Now it is a question of even acquiring the resources necessary to enable the transition you’re hoping to see. The biggest and best oil resources lately (which aren’t big and are far from the best) are the tight oil plays in the Bakken and Eagle Ford which produce tiny amounts of oil relative to all the work going into producing it. They also require fracking which also needs to stop. 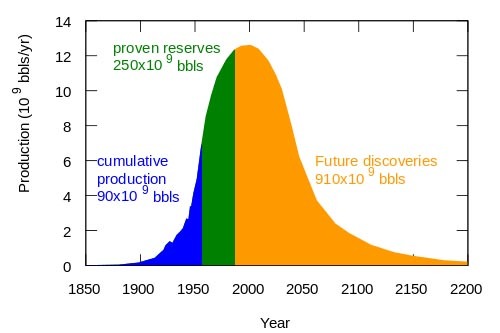 So why does Peak Oil (aka: resource depletion) matter? Because the physical realities of the situation will prevent any kind of RET transition from taking place without destroying the climate more than it already is. So, if you care about the climate you’ll vote to NOT pull more resources out of the ground to fuel an impossible RET transition. Yes, there are material requirements to utilize renewable energy sources, but those needs are less than the material and energy intensity to extract energy from nonrenewable sources with diminishing EROI. The alternative you’re talking about — a drastic and immediate energy descent — is not realistic, at least not by choice. Nor is it a desirable outcome. How long is that interim? The climate is already well past several tipping points. It may not be exactly as bad as Guy M. would have us believe but then again, he and the data are pretty convincing. I stand by my previous point that pulling the “interim” carbon out of the ground will make climate change far worse than it already is. Besides that obvious fact, there aren’t enough fossil fuels left to both build the future you’re hoping for and power the system until that that future is built. The alternative I’m talking about is far more realistic (as in, based in reality) than the dream of an industrial civilization powered by Renewal Energy. It might not be the future you want but physics will have the last say, not your wishes. I think we’re going to have to agree to disagree! In particular, I think this statement is incorrect: “there aren’t enough fossil fuels left to both build the future you’re hoping for and power the system until that that future is built.” The problem, as others have stated as well, is not that there aren’t enough fossil fuels; the problem is we have too much. And I flat out disagree with “The alternative I’m talking about is far more realistic (as in, based in reality) than the dream of an industrial civilization powered by Renewal Energy.” I would, though, amend “industrial civilization” – per my last sentence below…. Yes, using some of those fossil fuels in the interim will continue to exacerbate greenhouse gas emissions, but it will put us on the path to large scale reduction. Whether we’ve already passed critical tipping points is impossible to know and, if we have, no energy source or usage changes will help. So I strongly believe that, as a civilization, we need to pursue positive paths that don’t result in a retreat to pre-industrial revolution states and instead lead us to post-industrial revolution progress in terms of both our co-existence with the rest of nature on this planet and with bettering human wellbeing. And, yes, physics will have the last say (as in, nature bats last! ), but the verdict isn’t in and we have to pursue positive paths. That is a complete misconception. The oil industry is yelling from the mountain tops about how big the oil reserves are. What they’re not telling you is how fast they can access those reserves. Peak oil is about the rate at which oil is produced. Reserves don’t matter. It doesn’t matter if you have $5,000,000.00 in the bank if you can only pull out $500.00 per year. Globally speaking, conventional oil production has already peaked and is declining at about 6% per year. The new reserves they’re adding are in the form of tight oil and tar sands which are very slow to produce. One well in the Bakken or Eagle Ford costs $10,000,000.00 to drill and frack. Way more if it is re-stimulated. The average well will produce 665,000 barrels of oil in 45 years. It takes 643 seconds for the world to burn through that much at current rates of consumption. Since the oil boom in North Dakota began (2007) the world has consumed more oil than the state will produce over the next 60 years. Studying resource depletion (Peak Oil) tells us that the “large scale reduction” in fossil fuel consumption is going to happen long before RET can be developed and that it is going to look like economic decline. In fact, it is already manifesting as economic decline. The peaking of conventional crude oil production led directly to the Great Recession. 1: US oil production is going up thanks to monumental amounts of investment and drilling. The US will peak again around 2017 because the decline rate of this new tight oil is extremely high. 2: The Federal Reserve is printing more than $32,000.00 per second to buy bad investments off the banks. They print more money each month than existed in 1980. We may disagree on what future is possible but I hope that you no longer contend that resource depletion is irrelevant. It means that large international efforts are too energy intensive to pursue and would hurt the climate even more than it already is. Instead any technology development should be done appropriately (See Appropriate Technology Movement) and implemented on a very small scale. One of the most useful technologies we have at our disposal are the ones we’ve always had at our disposal. The rate at which we pull out oil has only been a problem when the producers have decided to limit it. Oil production, provided there are accessible reserves, will increase with price per the laws of supply and demand, so long as monopolistic or oligopolistic – or regulatory — forces do not intervene. As price goes up due to demand, more expensive sources will be tapped. This is precisely why fracking and tar sands are coming on line now. The price justifies it in the companies’ bottom lines. I never said resource depletion is irrelevant. I said the question of whether we’ve passed peak oil is irrelevant, and that focusing on the question is a distraction. Resource depletion, including rare minerals, etc., is a much broader topic than carbon fuel depletion. Appropriate Technology is ONE approach, generally advocated for less developed regions where complex and expensive technologies do not work as well or are unaffordable. It is NOT an across-the-board solution. While I’m not one who believes that technology will come to our salvation and solve all our problems, there are existing and new technologies that we will benefit from and that may be deserving of large scale implementation. Our combined ecological/economic/social issues will not be solved with a one-size-fits-all solution. Not advanced technology solutions, not a return to pre-industrial life styles, not geo-engineering, not adaptation; but will be pieces of all of these: radical energy efficiency, new and existing renewable energy sources, substantial decreases in unnecessary and unrewarding consumption, changes to our means of food production (as well as our eating patterns), adaptation (to rising sea levels and extreme weather), and perhaps even some geo-engineering (though I hope not). I left out population control because it is so controversial, but obviously population growth cannot continue and should be reversed. I’m sure you know the formula I = P x A x T, though I usually modify it to I = P x C (for consumption) x RI (for resource intensity). No disagreement there. Nothing beats having nature do most of the work for us! And, by extension, biomimicry is one of our best areas of material and technological advancement.